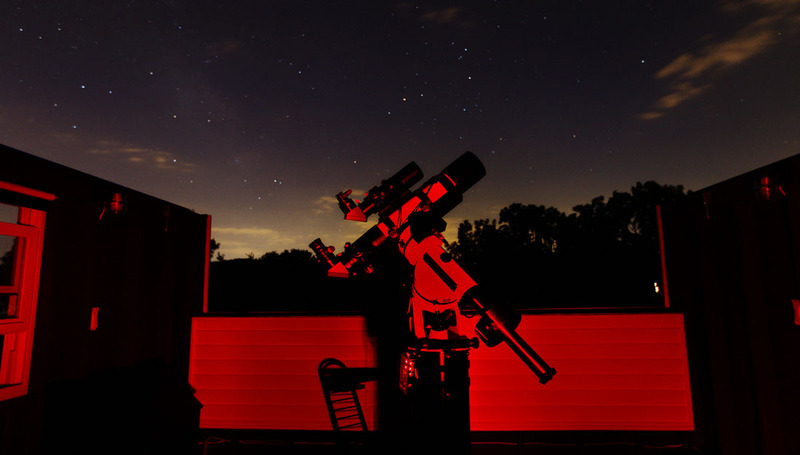 StarEffects Observatory at night with Scorpius and the "Teapot" of Sagittarius visible in the background. 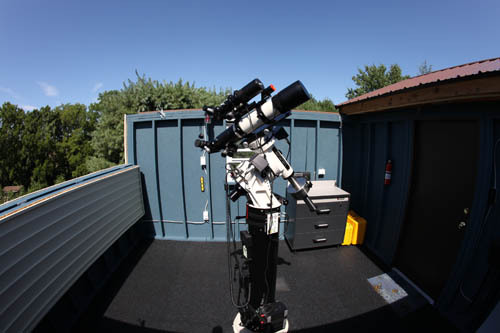 Since I was a child I had dreamed of one day owning a small sliding roof observatory from which to observe and photograph the night sky. 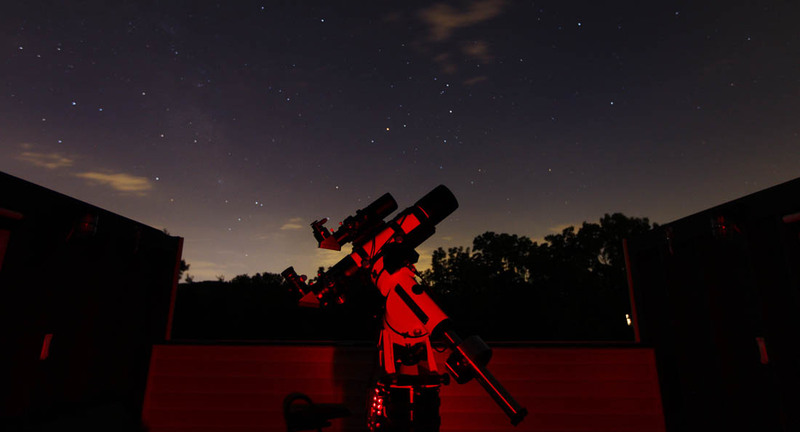 After trying my luck at astrophotography during the last couple of years it soon became apparent that the tedium of lugging everything outside and then setting up, polar aligning, and then having to tear it all down again between sessions would in all likelihood eventually drive me away from this hobby. 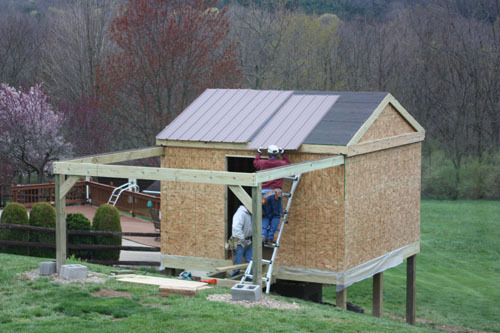 During the summer of 2010 I decided to move forward with the idea of having a sliding roof observatory built on my property. 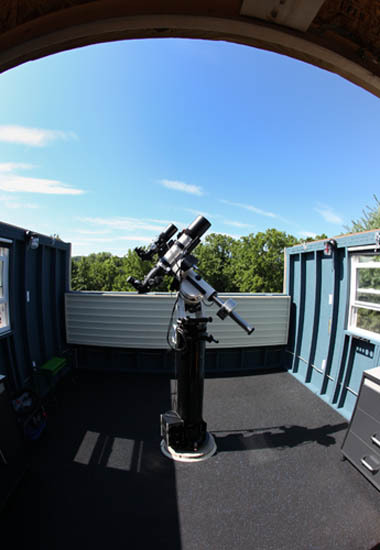 The plans and roller kit were obtained through "Backyard Observatories" Lodi, OH and Kirk Berger Construction (Womelsdorf, PA) was contracted to build the observatory. 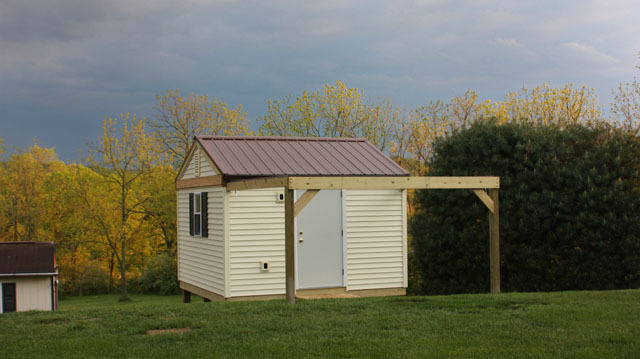 The first order of business was to pick a site for the 12' x 12' observatory. I needed to have a clear view of the north star for polar alignment, a high point looking south over the trees, have easy access from my back door yet not interfere with my septic system, and still fall within the township zoning ordinances for set backs, etc. This was not an easy task! 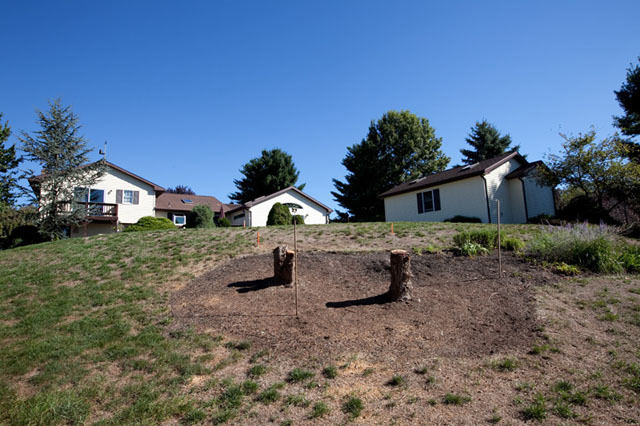 There was really only one choice and that was just slightly beyond my septic system on a side hill where two hemlock trees were located. Those trees would have to be sacrificed! 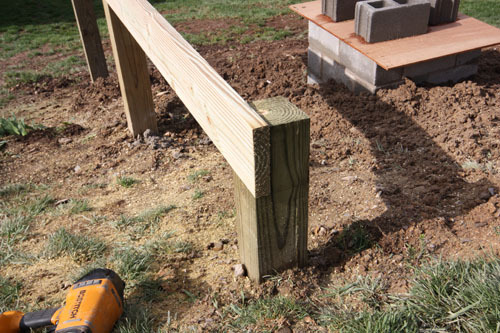 The first image above is looking SSW and the stake closest to you marks where the northeast 6" x 6" support post for the roof trellis---just at the edge of my sand mound drain field. The second image is looking NNE. Construction would now have to wait until after the winter due to various delays in obtaining a permit, bad weather, contractor availability, etc. 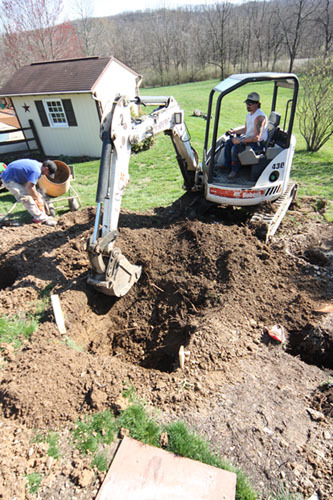 Foundation work finally begins April 14, 2011. 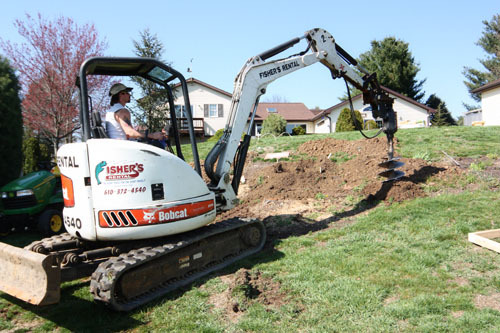 A series of 18" wide by 36" deep holes were drilled for the 6" x 6" foundation posts which would later be set in concrete. 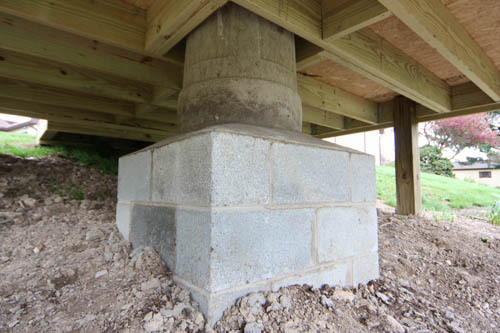 In the first photo can be seen three of the four stakes that mark where the footing will go for the telescope pier. This sure beats digging by hand! 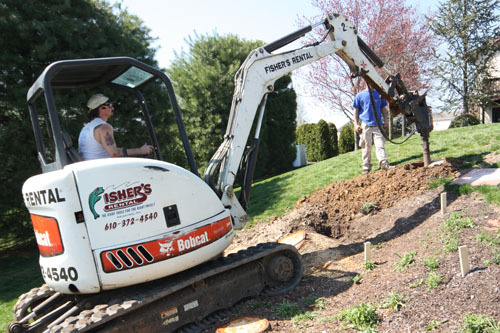 Pier foundation excavation and electric line trenching. 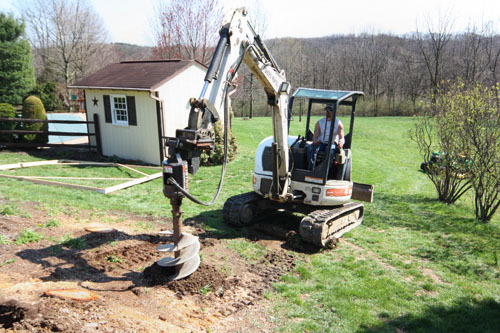 On the left we see the hole being dug for the pier foundation footing. 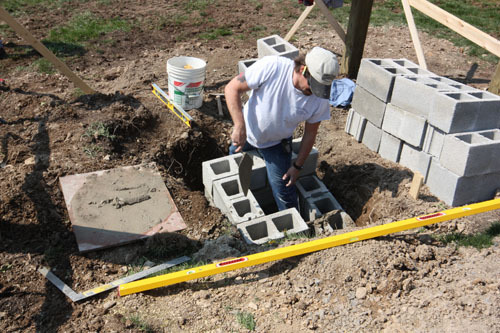 The hole measures about 48" x 48" and is 42" deep and will be filled with about 6" of concrete to serve as the platform footing for a 32" x 32" x 48" high cinder block base for the telescope pier. More on that later. 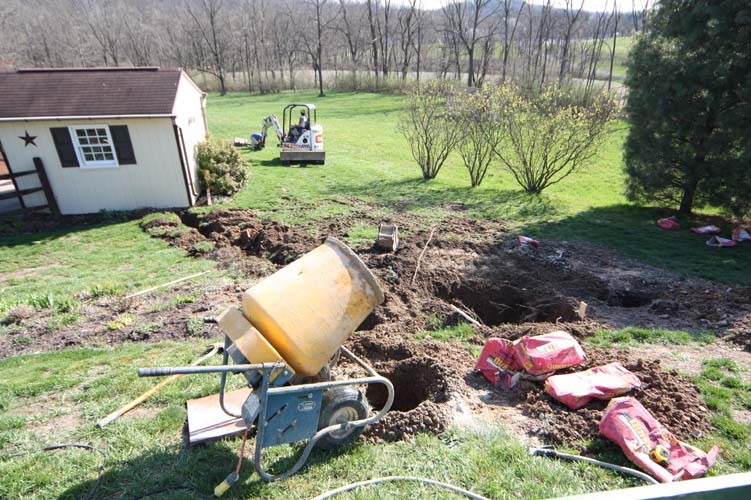 The image on the right also shows the trench that was dug for an underground electrical conduit that will pick up power for the observatory from a breaker box located in the pool house shed. Post setting and squaring up. 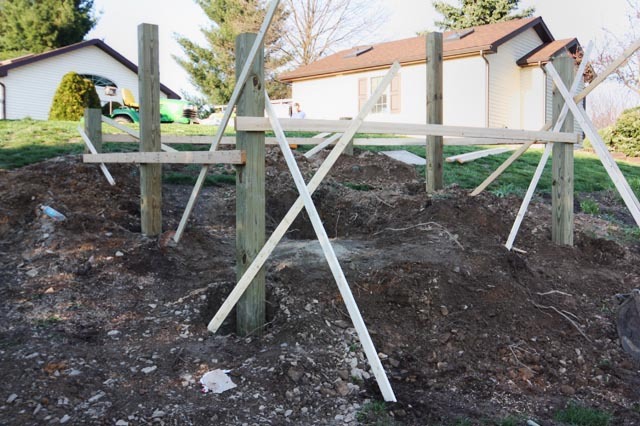 Posts are set into 36" deep holes and are being squared up prior to filling the holes with concrete. 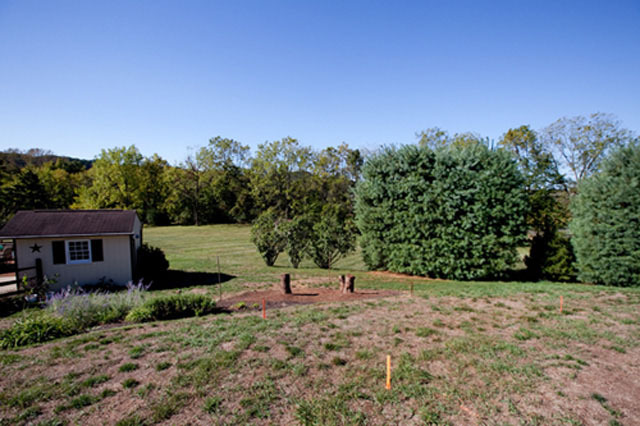 Because of the lay of the land and the location of my septic system the observatory will have a south-southwest to north-northeast orientation. The first (left) image is looking to the south-southwest. 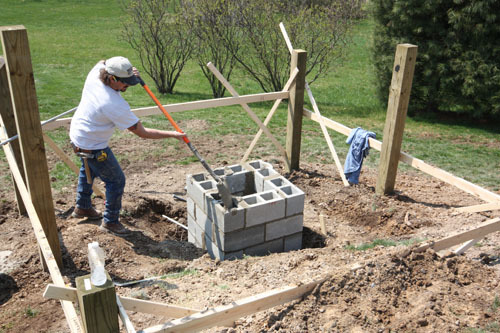 Notice the large pier hole in the center ready for the block work. Telescope pier base block being set and leveled April 15th, 2011. Since a good portion of the concrete telescope pier footing will extend above grade, a solid block perimeter is first constructed. 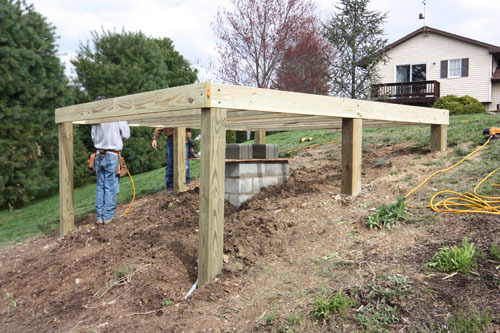 The actual concrete pier will later be poured into the center hole created by the four walls of the block foundation and this 18" diameter pier will then extend through the observatory floor via a custom form. 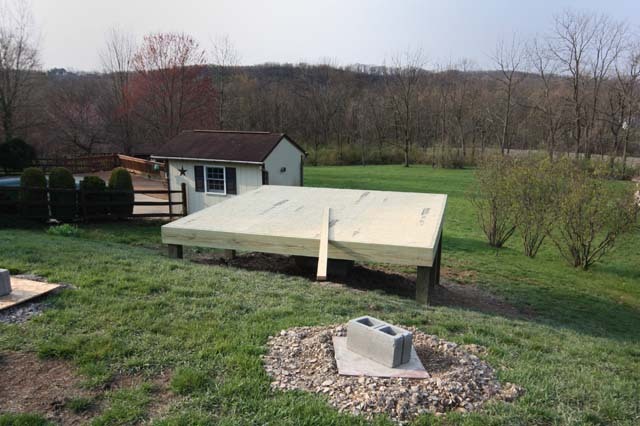 A sonotube filled with concrete was briefly considered, but the risk of shifting might be risky since about three feet of heavy concrete would extend above grade on a hillside. 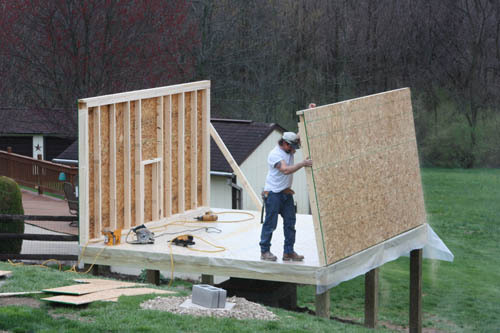 Kudos to Kirk Berger (laying block above) for coming up with this idea! 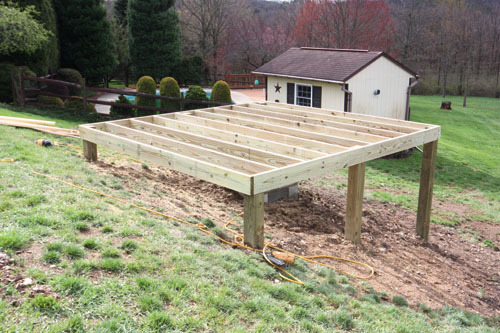 Decking framework and flooring begins April 17th, 2011. 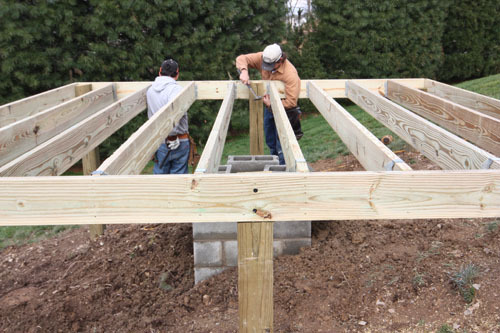 The first two images above show the outer framework for the floor joists being notched into the 6" x 6" foundation posts which have now been set in concrete and covered with dirt. 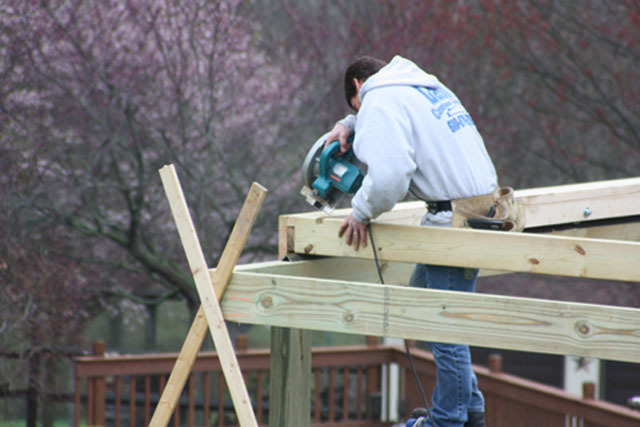 Next the 2" x 10" floor joists are being attached first with a nail gun and then with metal joist hangers. The first image below shows the Advantech composite tongue & groove subfloor being glued and nailed into place, notice the cutout in the center of the floor for the concrete pier that will be poured later. The image below on the right shows the finished floor with a 2" x 4" positioned so as to be pointing towards the north star. 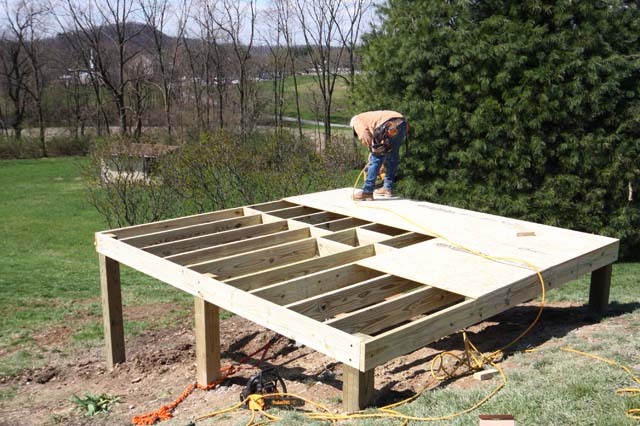 This will be outlined on the floor and will later assist in the placement of the J-bolt template that will be set into the wet concrete pier to assure the finished metal pier is pointing in the right direction. 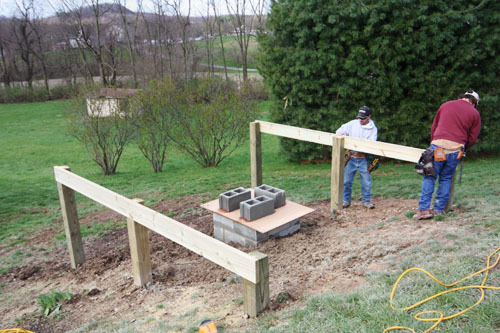 The cinder blocks mark where the future 6" x 6" sliding roof trellis supports will be placed. 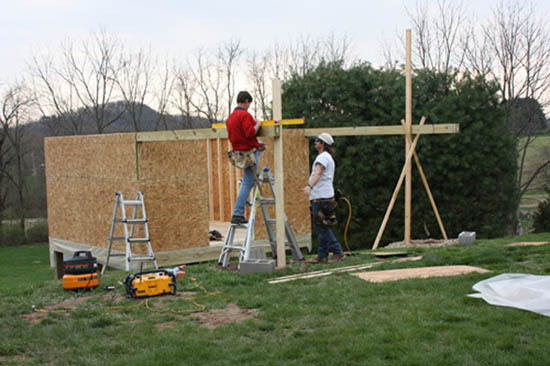 Wall construction on April 18th, 2011 just prior to installation of the framework for the sliding roof trellis. Roof construction & siding installation April 18th - 22nd, 2011 The trellis work is being framed and leveled in the top left photo above. 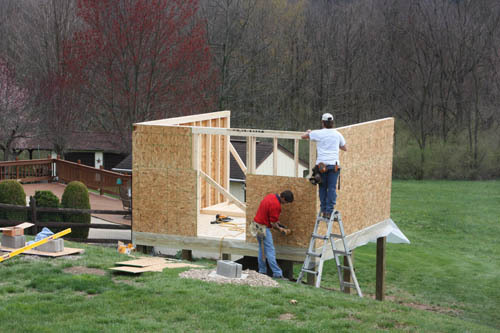 This is on the north side of the observatory and where the roof will slide when it is in the open position. 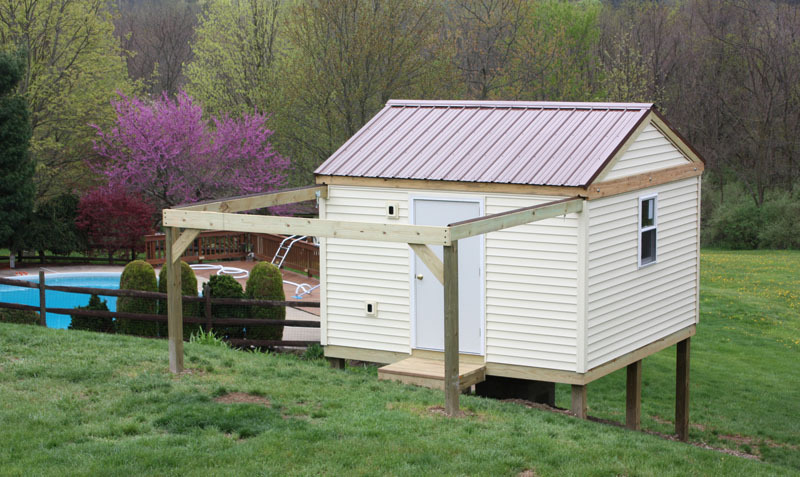 The top center image shows one of the two roof supports that house the heavy duty ball bearing rollers that will glide along the "inverted V" of 1 1/2" angle iron track that is secured via screws to the top of the observatory walls and roof trellis beams. 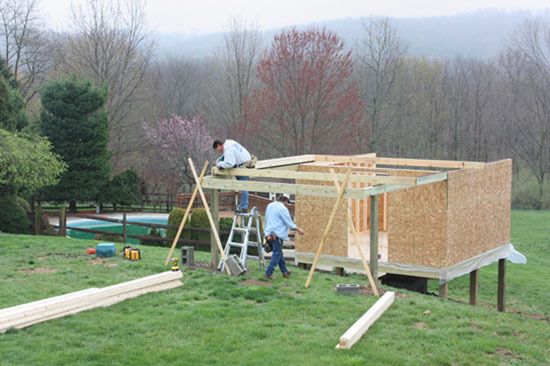 The sliding roof framework is being assembled as shown in the top right image. 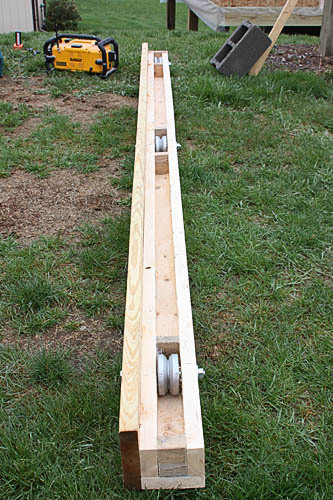 Part of the inverted angle iron track can be seen extending in front of the roof framework in the lower left image above. 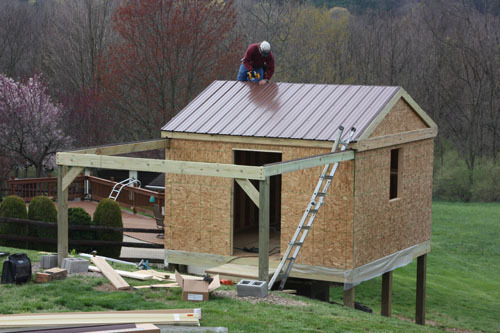 The framed and sheathed roof is being covered with rolled roofing paper while in the open position in the lower right image. 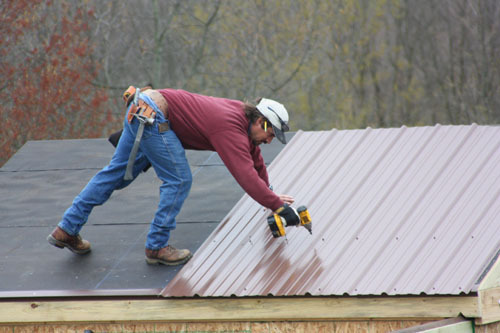 The images below show the installation of the metal roofing panels. Metal was chosen to keep the overall weight to a minimum. Although light colored roofs are recommended to reflect heat, a darker color was chosen in order to blend with the other buildings on our property. I later found out this had a side benefit in that it didn't reflect much light at night either! 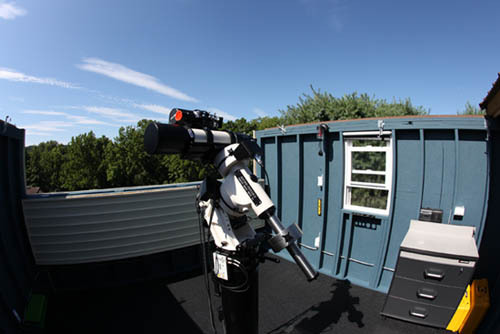 Whereas a light colored roof in the open position may have tended to reflect some unwanted light back towards any observers inside the observatory and thereby interfering with dark- adapted eyes. The bottom image shows the essential completion of the exterior construction on April 27th, 2011. 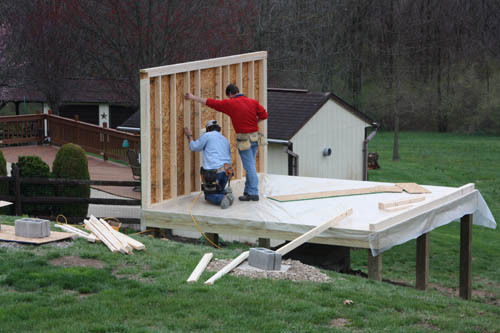 Staining of the exposed pressure treated lumber will be completed in the Fall of 2011. Concrete pier completed! 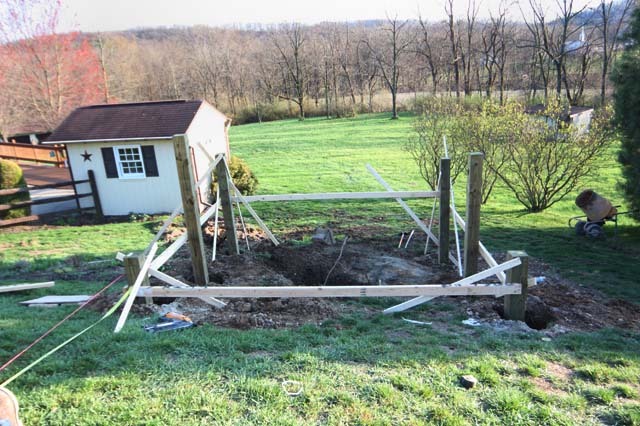 This was accomplished by pouring concrete into the hole formed by the concrete block (see Phase 1 photos above) and a custom form that extended to about 2" above the finished observatory floor level. 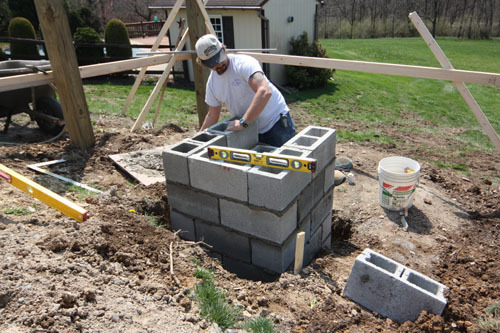 The total weight of the concrete block and poured concrete is estimated to be about 2700 pounds. The first image above shows the inside of the observatory with the 18" diameter pier extending above the floor level. Extending from the top of the pier are three threaded J-bolts that will anchor the 8" diameter metal Le Sueur Astro Pier to the concrete pier. Also shown is the electric conduit and cable that will supply electricity to the 110V - 15amp GFI receptacles on the metal pier. Notice the hinged drop down wall on the south side of the observatory which when dropped will offer a clear view to the southern horizon. 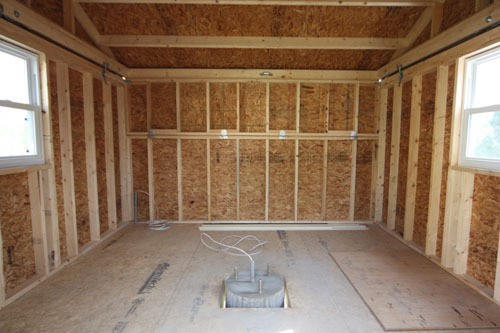 The center image shows the concrete pier extending through a framed opening in the floor. 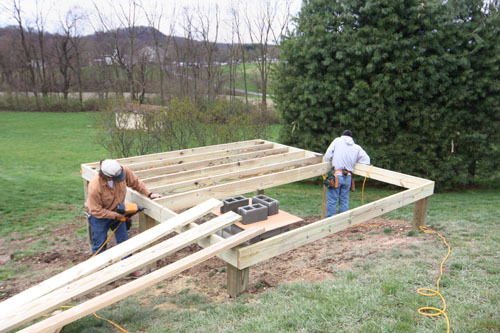 There is a minimum of 1" spacing between the framing and the pier to assure that no vibration can be transferred from the observatory floor to the telescope pier. The last image above on the right shows the pier from below extending through the observatory floor. 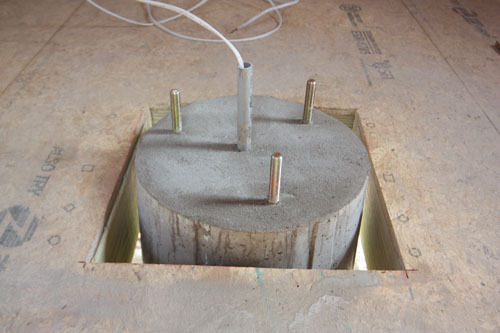 The first image above shows a metal receptacle box being drilled and tapped into the metal pier base, this will add 4 additional 110v duplex outlets for a total of 6 outlets that will be ready and available directly from the metal telescope pier. You can never have too many electrical outlets! 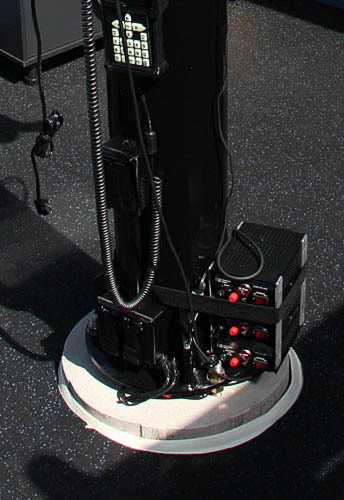 The photo on the right shows the 12V power supplies which are used to run the telescope mount, dew heaters, auto guiders, etc. Also notice that the Advantech flooring has now been covered with 3/8" rubber interlocking floor tiles to help guard against damage to dropped eyepieces and to help keep the feet warmer on cold winter nights. Also notice that a rubber garage door seal was wrapped around the base of the concrete pier to help seal the opening against insects, etc. 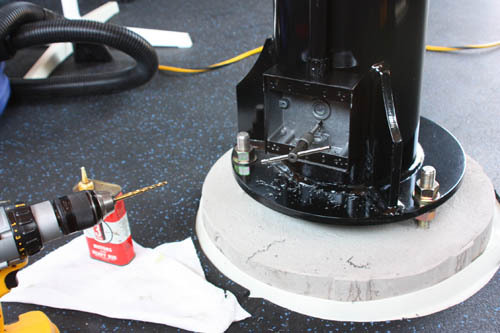 This material is very soft and pliable and will not transfer any vibration from the observatory floor. 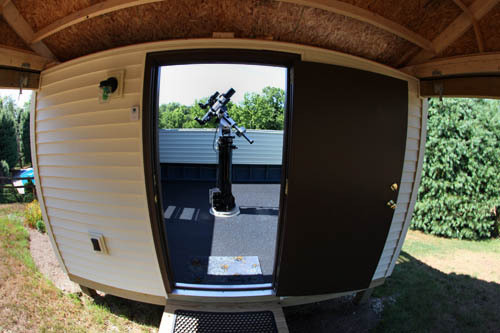 The final project was to finish off the interior of the observatory then attach the mount and telescopes to the Le Sueur Aurora Astro Pier. My wife painted the interior walls with Behr Ultra flat matte paint appropriately named "Observatory Blue"! 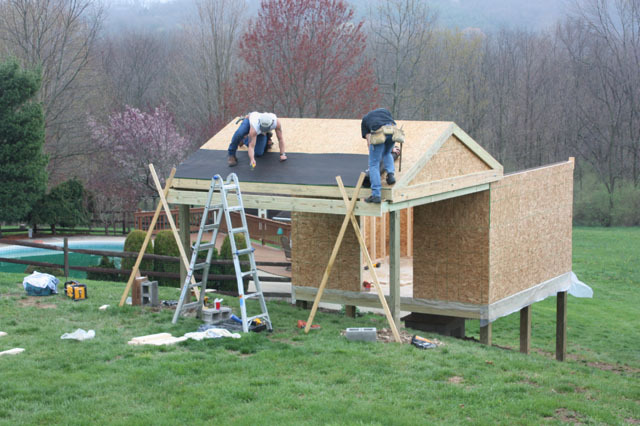 The roof underside need not be painted since it is not visible while in the open position. Next came the electrical wiring which includes several GFI outlets and two CFL light fixtures, one in Red (visible in the left image above) and on the opposite wall was added a dimmable white CFL fixture. The sub-floor was then overlaid with 3/8" rubber interlocking tiles from rubberflooringinc.com and light blocking black window shades were added. Lastly a couple of storage cabinets with work tops were added. 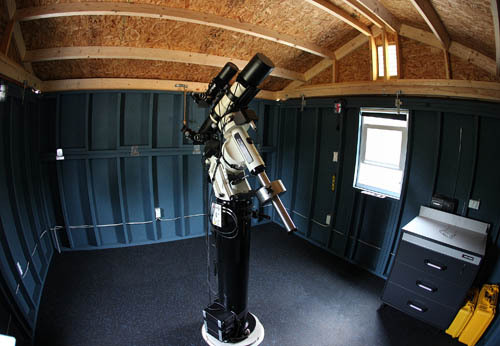 The finished interior measures just shy of 12' x 12' and offers plenty of room to view thru the scope in ANY position without bumping into the walls or cabinets. 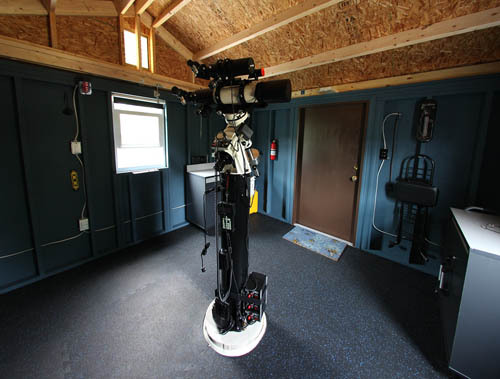 An Astro-Physics AP900GTO German Equatorial Mount tops off the Astro Pier and to that is mounted a TeleVue 4" APO refractor (NP101is) and a piggy-backed TeleVue TV60is that doubles as a guide scope. For now my primary interest is in wide-field imaging. 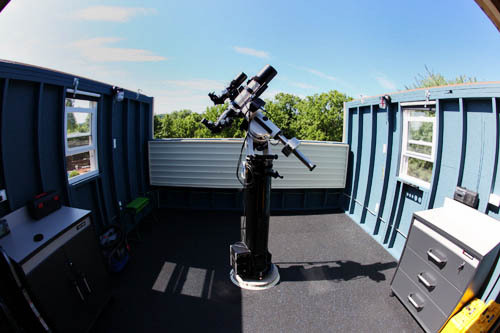 Many different types of building materials were used to create the observatory including interlocking tiles, concrete, wood, cinder blocks, and metal. Also shown is the electric conduit and cable that will supply electricity to the 110V - 15amp GFI receptacles on the metal pier.